The area around Kings Highway, in between Midwood (sometimes known, especially by its Orthodox Jewish residents, as Flatbush) and Sheepshead Bay, has been a magnet for very wealthy segments of New York’s Russian and Syrian Jewish population. But with growth strangled by its single-family zoning, this wealth has mostly expressed itself in the form of tear downs, with families, especially Syrian ones, paying millions for modest, middle-class homes, which are then razed and replaced with opulent mansions. But as the population ages, one developer is betting that some of them will be looking to downsize from 10,000-square foot homes. Under construction at 1769 East 13th Street, the Lighthouse, as the building is called, will cater to those looking for Manhattan-style design and amenities in the community they’ve built their lives around. 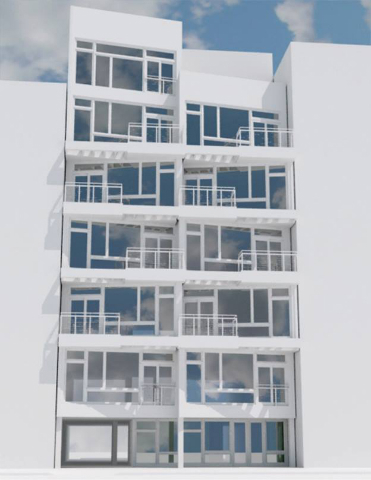 The boutique building will have just 11 units spread over its seven floors, with two two-bedroom, two-bathroom units on floors two through six. Most new condo buildings in the area feature traditional brick façades, but the Lighthouse – designed by Henry Radusky’s Bricolage Designs, based on nearby New Utrecht Avenue – will be sheathed in modern, floor-to-ceiling windows. It will also have amenities commensurate with its price tag, with every unit having balconies and a Jacuzzi in the master bath. The cellar will feature an indoor lap pool, Jacuzzi spa, sauna, steam room, and showers, in a nod towards Russia’s banya culture. While more expensive than others in the area, the condos at the Lighthouse will offer a more affordable alternative to the increasingly pricy single-family homes that blanket the rest of the neighborhood. The luxury units will also be a better deal than those in the gentrified and gentrifying areas of northwestern Brooklyn, with superior amenities in a more stable area. 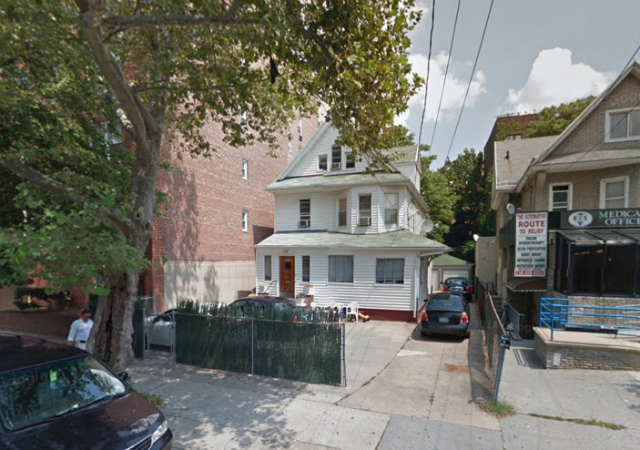 The building will likely not have too many competitors, as Homecrest (the neighborhoods proper, if little used, name) was downzoned during the Bloomberg administration. Planners writing the 1961 code saw the demand for growth in southern Brooklyn, at a time when the northern half of the borough was in sharp decline, and planned for further densification of the single-family homes in the area. The low-rise blocks bounded by Coney Island Avenue, Ocean Avenue, Avenue P, and Avenue S were zoned R6, allowing tenement-scale redevelopment. But Amanda Burden’s Department of City Planning thought the 1961 code too permissive in this area, and as part of their “contextual” rezonings, severely restricted growth in the area. Construction at 1769 East 13th Street began in 2008, but only the foundation was poured before the site stalled because of the recession. 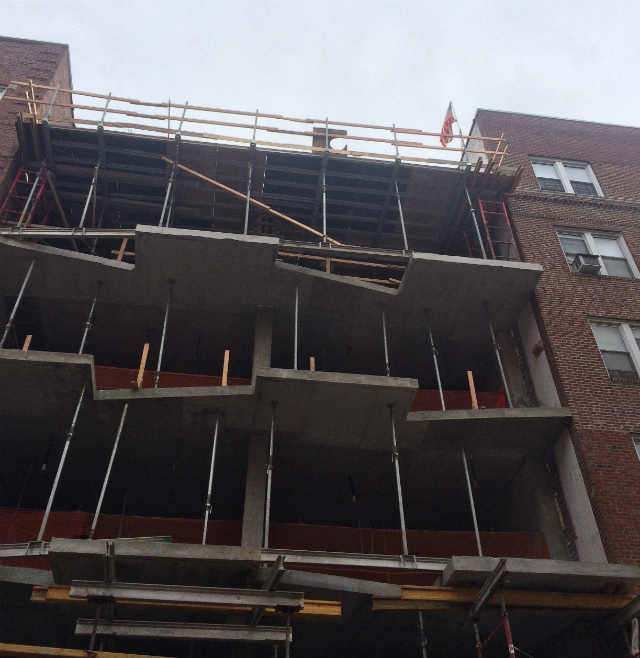 Rychik restarted the project in May of this year, and the building is now nearly topped out. Completion is projected for next May or June.